In honor of the recent release of Harry Potter and the Cursed Child, here are just some of the memorable magical aspects J.K. Rowling created in her classic Harry Potter series. You may notice they are all elements introduced in the first book. They are also some of the tipping points that threw me more and more in love with the story. Soon after Harry arrives at Hogwarts for the first time, he meets Ron and Hermione, and they become friends--friends he might not have come to know so well had they not all been placed in the same house together. 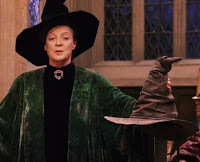 Of course, that house is Gryffindor, where Harry flourishes both on his own and as part of a group, and it was the magic of the sorting hat that put him there, having taken into consideration his heart, his past, and his decisions. 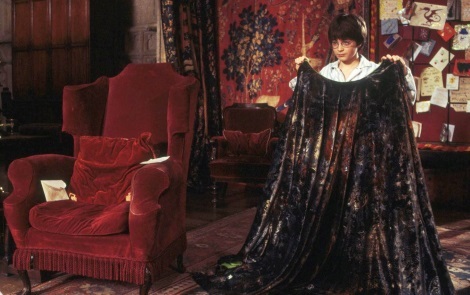 On Harry's first Christmas morning at Hogwarts, he finds a mysterious gift left for him at the foot of his bed--a cloak of invisibility. When he dons the cloak, often joined by his pals Ron and Hermione, his adventures around Hogwarts take on another element as he can go to forbidden places about the school and grounds, particularly after bedtime hours when the castle is at its most eerie and mysterious. One of the most memorable of these moments for me was Harry's first sneaky excursion in which he visits the restricted section of the library in search of information on Nicolas Flamel, and finds the shrieking book that nearly gives away his cover. 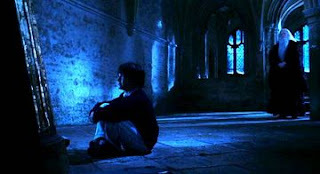 Speaking of Harry's excursions with the invisibility cloak, it is while he escapes from Filch and Professor Snape on that first late-night outing that he encounters the Mirror of Erised hidden in an unused classroom. Inside this mirror, which shows the "deepest, most desperate desires of our hearts," Harry sees an image of the deceased family he never knew. Dumbledore, in his wise fashion, warns upon discovering Harry with the mirror one night that it gives "neither knowledge or truth" and that "men have wasted away before it." "It does not do to dwell on dreams," Dumbledore says, "and forget to live..." Dreams are a wonderful thing that inspire, motivate, and even center us. But we may sometimes need the gentle reminder offered so simply and profoundly in this piece of fiction to focus on the hope and possibility of each moment before us, even using the wishes of our hearts and our very character as a guide. There are so many amazing and meaningful elements in the Harry Potter stories. What are your favorites? I love the Room of Requirement. "... it is a room that a person can only enter when they have real need of it. Sometimes it is there, and sometimes it is not, but when it appears, it is always equipped for the seeker's needs." Sometimes a broom closet, sometimes a training room... it's a wonderful concept. Fun idea, Laura! I've always been intrigued by the Mirror of Erised, too - I'd be so curious to see what would show up for me! And his talk with Dumbledore about it was such a great moment in Harry's development. The Room of Requirement is an excellent choice, too, Melinda! So creative, and it would really come in handy :) One of my favorites is polyjuice potion, especially since they put it to such interesting uses in several of the books. I love all these things, but I just love the whole concept and how J.K. Rowling intertwines the magical world with our own so seamlessly. The room of requirement is a great one, Melinda. I also love the Marauder’s Map! More fun mischief around the castle. Laurie, thanks! I love that moment between Harry and Dumbledore at the mirror, too. The polyjuice potion was so clever and fun too! Spruce, I completely agree. Isn’t it amazing how she did that and made it all seem so simple?